Tonight is the end of this Total Wellness Challenge. I can’t say I am going out with a bang, but I can say I learned some things and am looking forward to having guests for dinner tonight and having pie for dessert! While I am not thrilled with my last few days on the Challenge, I did ok. Considering I celebrated a wedding anniversary with some wine and also enjoyed a beer on a Friday night, I stuck pretty closely to the nutrition guidelines. I felt absolutely EXHAUSTED every morning this week, which is not normal for me. It was dark and rainy, and I may or may not be having some hormone issues, so will hope that this phase ends soon with more sunlight and a change in my internal mood mechanism. We had a leftover seafood stew on our anniversary, and I had a glass of wine. We are taking a trip in a week or so, which we will use as our “official” celebration, so this was not a super special occasion, but we did toast 26 years! Because it was so rainy all week, my exercise routine was altered. I did some hill repeats one morning after the rain stopped on my bike and did a tabata-style workout in my garage, but was not super-focused. Friday was finally a nice day! I slept in and promised myself I would ride my bike later when it warmed up a bit. This is always a risk for me – often if I don’t get out in the morning, I will back out of plans for a midday or afternoon workout because I am too wrapped up in work. Not this time! 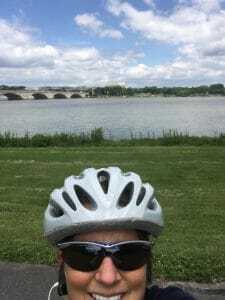 I headed out in the early afternoon for a lovely ride, about 17 miles, past the Potomac River and my favorite views of Washington, DC. 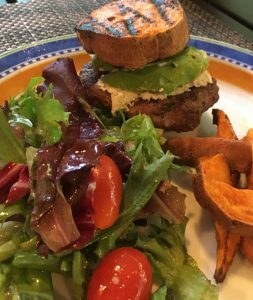 On Friday night, we grilled burgers, and I had mine on sweet potato “buns” which is now my favorite way to eat a burger. I had experimented and made some cashew cheese, which I used with some avocado to make a tasty topping. Steve grilled some sweet potato fries and we had a nice green salad. I did have a beer to celebrate getting through a long, dark and stressful week, and it was worth it! I seem to always fizzle out on stretching. I started with my best and longest record ever, but seem to have lost the inspiration. Once my commitment to “perfect” points dissipates, the first thing to go is the stretching point. It just doesn’t seem worth it to me, which sounds silly, since it is not a big time commitment and is pretty easy to do. And yet, it is not a priority for me, and I can’t lie and say it will be. Similar to stretching, meditation for me is just not enjoyable. It is very forced. I have tried it and will not give up on trying it, but don’t know if I will ever be a convert. The other lifestyle challenges: Sleep, Gratitude and Decluttering, are all relatively easy for me to work into my daily life, and mostly I do these things regularly anyway. I got really discouraged when, after logging near perfect points for two weeks, I gained weight. While my main goal wasn’t to lose weight, I was looking forward to losing a bit of the “heavy” feeling I had and assumed that a couple of pounds would naturally come off. I felt great after the first week! I don’t know if it was a hormonal shift, or something else, but during the second week I started to feel worse, and by the third week my clothes felt tighter and my waste felt thicker. I had a few social engagements, which made it hard for me to stick to my guns and have willpower to resist non-TWC foods, but I didn’t go overboard. I started not caring about losing points occasionally. Although I tried to stick to the TWC guidelines, I admit I took a few liberties where I shouldn’t have and in hindsight didn’t deduct a point here or there where I should have. I also seemed to really lack the discipline, motivation and interest I started with. This doesn’t just apply to the TWC, but to my daily lack of “routine.” I crave routine and consistency, but it does not come naturally to me. I feel like I am always looking to find a shortcut, diversion or excuse to change the plan. I really want to have a more organized, disciplined daily schedule and am realizing that as organized and “Type A” as I am, I am not as productive as I know I could be if I stuck to my guns and didn’t allow myself to be diverted off tasks all day long by emails and other self-made interruptions. When I feel in control and mindful of my schedule, I am more likely to feel in control of my eating, fitness and overall behavior. Nutrition goals: I want to be mindful about what I eat, and to sit down and focus before I put a bite in my mouth. It will apply to my menu in that I will prepare healthy options to be available and plan meals for the week ahead. Fitness goals: Since I seem to need more sleep lately, I am going to offer myself a midday exercise option for days when I feel too tired to join my morning exercise groups, and I am going to stick to it. Lifestyle goals: Most importantly, I am going to commit to time-blocking my schedule every day to be more mindful and focused on my work and life tasks. I am going to use a notebook for now, and perhaps move to a physical day planner, to help organize time blocks each day, and am also going to assign, and hopefully stick to, a weekly block schedule as well. I will give myself my own point system: 1 point for each goal each day, so up to 3 points per day. If I have 90 points at the end of June, I will treat myself to something nice! I am going to continue to blog about my new “TLC Challenge” to hold myself accountable.